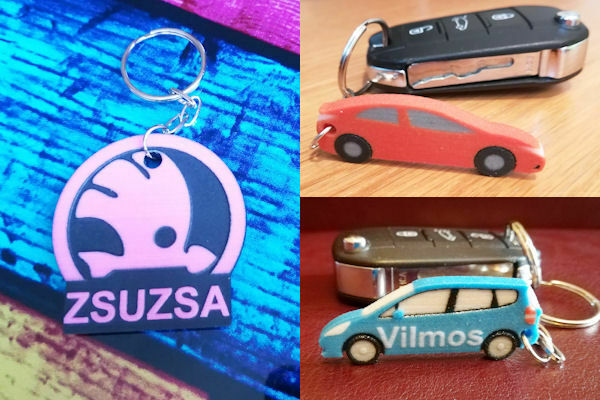 Would you like a 3D printed car keychain with a unique label on it? You are at the right place. With an unique 3D printed gift you can create imaginative and creative surprises for anyone. Don’t forget the text on the keyring can be anything it only depends on your imagination what we will 3D print out. Eg. Registration number, name, nickname, company name, place-name, car, motor brand, service name, etc. What kind of car keychain (type, color) do you want? Order one of our 3D prints below! Honda Civic Type R Keychain with custom text option. 3d printed product. The text can be anything and depends only on your creativity. Eg. : licence plate number, nickname, company name, premisses, car model, garage name, etc. Nissan Qashqai Keychain with custom text option. 3D printed product. The text can be anything and depends only on your creativity. Eg. : licence plate number, nickname, company name, premisses, car model, garage name, etc. Skoda Octavia 3D keychain with custom text option. 3d printed product. The text can be anything depends only on your creativity. Eg. : licence plate number, nickname, company name, premisses, car model, garage name, etc. Honda Civic Keychain with custom text option. 3d printed product. The text can be anything and depends only on your creativity. Eg. : licence plate number, nickname, company name, premisses, car model, garage name, etc. Opel Crossland 3D keychain with custom text option. 3d printed product. The text can be anything depends only on your creativity. Eg. : licence plate number, nickname, company name, premisses, car model, garage name, etc. Suzuki Vitara 3D keychain with custom text option. 3d printed product. The text can be anything depends only on your creativity. Eg. : licence plate number, nickname, company name, premisses, car model, garage name, etc. Opel G Astra 3D keychain with custom text option. 3d printed product. The text can be anything depends only on your creativity. Eg. : licence plate number, nickname, company name, premisses, car model, garage name, etc. Words, numbers, names - Whatever can be on these car keychains and you will not mix up them. Or have your friend, girlfriend's name, nickname on it and give it as a personalized gift! But you can surprise your loved one with a unique ignition key holder with the nickname or license plate number of his/her favourite car. This is certainly not to be found in stores! A modern 3D printed Car Shaped keychain is not only a practical way to keep keys together but a trendy and fashion accessory. These style of key rings can show your love to your favorite car and freedom. It could be really amazing and lovely suprise for kids or anybody who likes cars.